GO-SPIN is a methodological tool to map national science, technology and innovation (STI) landscapes and analyse STI policies and their implementation. The open-access platform offers innovative databases with powerful graphic and analytical tools for the use of decision-makers, parliamentarians, universities, knowledge brokers, companies, specialists and the general public, with a complete set of diverse information on STI policies. Digital library of UNESCO STI documents over the last six decades. 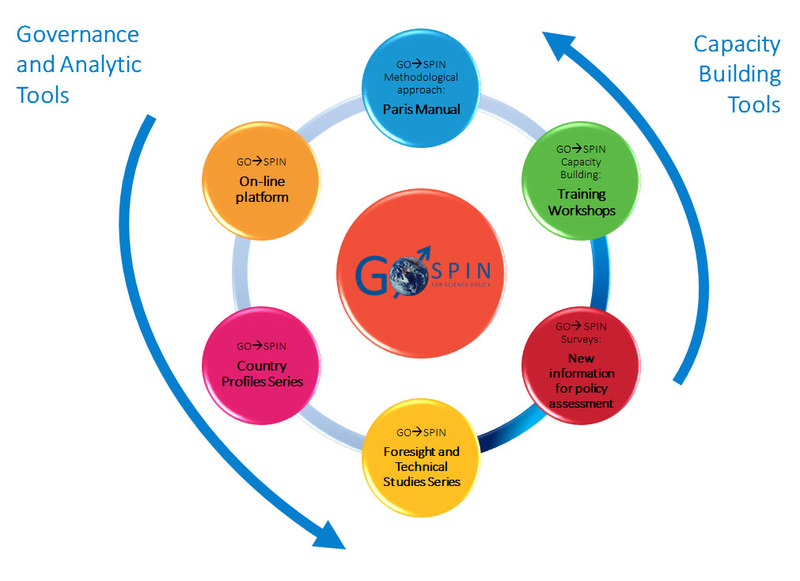 A prototype of GO-SPIN, the Latin American-Science Policy Information Network (SPIN), is already operational. It covers Latin America and the Caribbean and is regularly updated with information on the STI systems of the 33 countries in the region. To enhance policy coordination and cooperation among ministries, academia, civil society and private sector. Training STI stakeholders in design, implementation and evaluation of STI policy instruments. Standard practice for surveys on STI policies and policy instruments (Paris Manual). Worldwide distribution of the GO-SPIN national surveys. Creation of an online, open access platform for decision-makers, knowledge- brokers, specialists and general-public with a complete set of various information on STI policies.